3 twin bed rooms, 2 bathrooms one en-suite. Winter Gardens.We have three apartments two Three bedroom apartments sleeps 8 people and one two bedroom sleeps people, This exciting development on Golf del Sur was completed in 2002, it features an all weather floodlit bowling green made to international standards. The apartment with 3 bedrooms is on the first floor, approached by either stairs or a lift, with a balcony which is south facing. 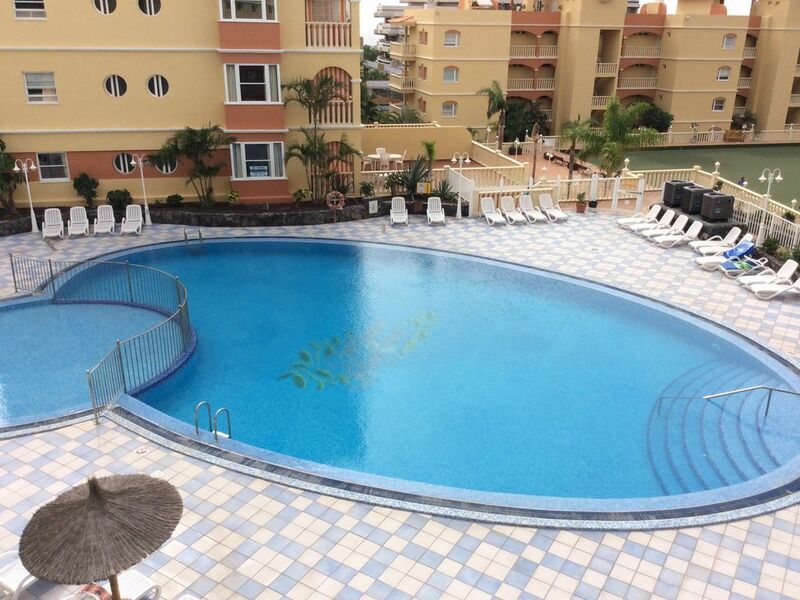 On site there is a good sized swimming pool and children's pool adjoining. I am afraid the gym has now closed but there is one available at the Aguamarina Hotel just across the road. Two garages are available on the complex should you hire a car. Please contact owners for website details of useful flight agents. This complex is in a very quiet area with no more than 20 people using the sunbeds. Out & about the region: Winter Gardens is approximately 15 minutes walk from San Blas Shops, Restaurants and live free entertainment. Near to the complex is an excellent Chinese restaurant, Tapas bar, very good fish restaurant and Irish bar. Something to suit everyone. A new marina is only 250 metres away. Situated at the nearby golf club is putting green, driving range and mini golf, there is also a tennis court. A short walk from San Blas is the fishing village called Los Abrigas where some of the finest seafood restaurants in Tenerife can be found. Because of the terrain this walk is only suitable in daylight. The nearest large beach is at El Medano about 4 miles away Los Cristianos and Playa de las Americas is about 15 minutes drive away. Beach towels available for 3 Euros per person but must be pre-booked. Car Hire. Gullivers, San Blas; The Golden Bay Chinese, the Japanese and the Harbour Lights close to the apartment. I am a retired farmer, my wife and l purchased these apartments in 2002 and have been renting them out to family and friends since then. We use them two to three times a year, as do our family and grand children. Had a great time once again, ideal base to enjoy your holiday from with all you need in walking distance. Looking forward to next year. Great, the apartment, the location, restaurants. Would recommend for a relaxing holiday. Will return very soon. Winter Gardens is approximately 15 minutes walk from San Blas, restaurants and live free entertainment. Near to the complex is an excellent Chinese restaurant, Tapas bar, very good fish restaurant and also an Irish bar Pedros is now open on Winter Gardens + a Japanese Harbour Lights and a Mexican plus 2 or 3 other Restaurants 100 m away on the sea front. A new marina is only 250 metres away.There is a large sandy beach at El Medano about 4 miles away Los Cristianos and Playa de las Americas is about 15 minutes drive away.